How to write in your books (and other texts), part 2. 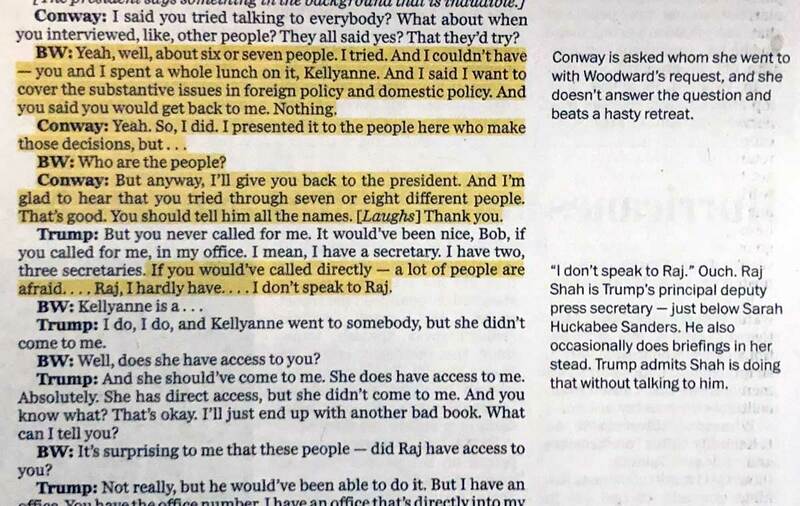 This morning’s Washington Post devotes an entire page to a marked-up transcript of a recorded conversation featuring Bob Woodward, President Trump, and Kellyanne Conway. Reporter Aaron Blake models critical reading: noting key passages and comparing them both to each other and other information he knows. In a particularly good section, Blake examines both internal tensions (Conway’s refusal to answer who denied Woodward’s request for an interview with Trump) and external tensions (Raj Shah’s position as principal deputy press secretary vs. Trump’s statement that “I don’t speak to Raj.”). Also note how earlier in the transcript, Conway shifts to the passive voice to obscure responsibility: “I put in the request. But you know, they — it was rejected.” Woodward asks, “Who are the people?” in a failed effort to pierce the fog. Meanwhile, on Twitter, Bill Hayes has posted several photographs of books annotated by the late Oliver Sacks. Sacks not only flagged key passages; he also recorded his own reactions, turning his reading into an active conversation with the author. See also, How to write in your books. This entry was posted in pedagogy and tagged books, critical reading, reading on September 5, 2018 by admin. How to Narrow a Research Topic. Primarily for undergraduates in capstone courses and graduate students in research seminars, but really for anyone who needs to define a manageable history topic. This entry was posted in pedagogy, website updates and tagged research, teaching on May 31, 2017 by admin. Making marginalia (notes or symbols written in the margins of a document) is the best way to get the most out of the time you spend reading a difficult text. This entry was posted in pedagogy and tagged books, reading on October 19, 2016 by admin. New advice for doctoral students in history: “How to Take an Oral Comprehensive Exam.” The process should be one of the most valuable experiences in graduate school. This entry was posted in pedagogy, website updates on February 7, 2016 by admin. To complement my existing instructions on How to Write an Outline, I have added an Article Outline Example. By keeping the outline to just the top two levels, this document outlines Wells’s article in just a page and a half. This entry was posted in pedagogy, Uncategorized, website updates and tagged outlines on December 19, 2014 by admin. This entry was posted in pedagogy on July 15, 2014 by admin. This manipulation of language reminded me of George Orwell’s incisive 1946 essay, “Politics and the English Language.” Although the focus of his essay is the bankrupt verbiage favored by politicians, Orwell could just as easily have been describing corporate-speak at G.M. This entry was posted in pedagogy on June 12, 2014 by admin.